・UPDATED! Enhanced breed predisposition information demonstrates in which dogs and cats dermatologic conditions are more likely to occur. ・NEW! Pattern approach dermatology content describes (with topographical images) where on the body, and in what formations, common dermatologic diseases exhibit. ・NEW! Updated key charts and tables, including: diseases affecting particular body regions, classification of common diseases by age of onset, and classification of symmetrically distributed disease from asymmetric disease. ・EXPANDED! Enhanced coverage of MRStaph and zoonotic and contagious skin diseases so you stay in the know. ・NEW! Hundreds of new, high-quality images showcase better examples of conditions discussed in the text. ・UPDATED! Two thoroughly revised chapters include the most up-to-date information on differential diagnoses, algorithms, and diagnostic techniques. ・NEW! 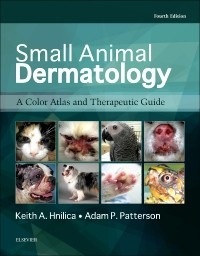 Co-authored by a recognized consulting dermatologist, Dr. Adam P. Patterson, making this an authoritative resource for the diagnosis of skin disease in small animals. ・NEW! Addition of bulleted content within each disease description informs you of specific indications of when it is necessary to culture and biopsy skin. ・UPDATED! The latest coverage on select diseases throughout, such as SLIT and Apoquel. ・NEW! Updated cutaneous lesions content with accompanying clarifying images explain what they mean and look like. ・UPDATED! Pyoderma content described based on the depth of disease, corresponding lesions, diagnostic/treatment plan, and common clinical entities of pyoderma fitting the depth of disease. ・Well-organized, concise, yet comprehensive, coverage of over 250 skin diseases in dogs, cats, birds, and exotic pets like rabbits, ferrets, hamsters, guinea pigs, gerbils, chinchillas, turtles, snakes, and lizards allows for quick and easy reference. ・Comprehensive drug appendices highlight information about dosage, adverse reactions, indications, and contraindications for antimicrobial, antiseborrheic, and antipruritic shampoo therapy, topical, otic, and systemic therapeutic drugs. ・Detailed procedures include helpful illustrations of key techniques. ・Thoroughly covers each disorder with recognizable clinical signs, top differentials, diagnostic tests, treatment recommendations, and prognoses. ・More than 1,450 vivid, full-color images in atlas format clearly demonstrate clinical appearance of skin lesions to facilitate accurate diagnosis and treatment. ・An atlas of before- and after-treatment images provides you with a compelling client communication tool to promote treatment acceptance and compliance. ・Emphasizes important information on the continuing emergence of zoonotic skin diseases in each chapter.